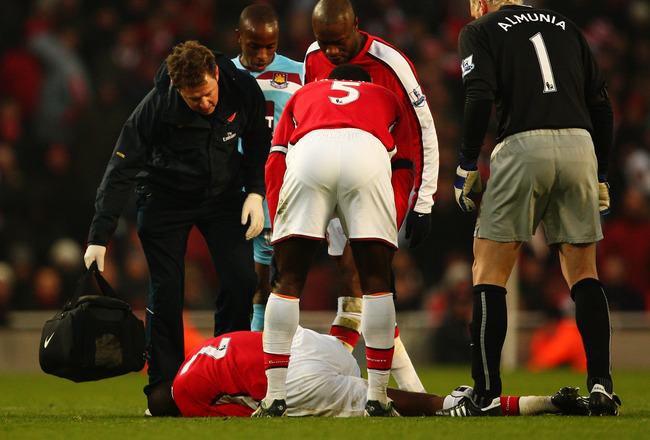 Abou Diaby and Injuries: A Curse from Beyond? Truth be told, injuries have become part and parcel of the modern game. The competitive nature of football has led to teams battling each other for the ultimate goal of gaining victory and like every battle, there are casualties. In a club as technically proficient like Arsenal, they are players that are always on the line of fire due to their style of play while there are others that are just unlucky. I don’t know if there has been a horrible cause placed on Arsene Wenger and his team (not talking about the trophy drought here) because it’s extremely shocking to know that almost everyone in the team has suffered a major injury at some point in their Arsenal careers with the exceptions of Olivier Giroud, new boy, Nacho Monreal, that has been with the club for a month and Santi Cazorla, that is terribly fatigued. In goal, Wojciech Szczesny (ruptured tendon and ankle), Lukasz Fabianski (shoulder and ankle) and Vito Mannone (thigh) were all missing at a point in time that made Arsene Wenger to coax Mad Jens Lehmann out of retirement to stand between the sticks against Blackpool in April 2011. There was also a curious case of the defense, where all recognized fullbacks, Bacary Sagna (lower leg), Andre Santos (ankle), Carl Jenkinson (back) and Kieran Gibbs (stomach, foot, ankle and for just being Kieran Gibbs) were all missing in action. There have also been periods when center backs, Thomas Vermaelen (Achilles tendon), Per Mertesacker (ankle), Laurent Koscielny (back and calf) and Seb Squillaci (back) have faced spells in the sidelines. Arsenal’s midfield is obviously synonymous with injuries with the likes of Aaron Ramsey (lower leg), Tomas Rosicky (hamstring, Achilles Tendon and ankle), Mikel Arteta (ankle), Jack Wilshere (foot and ankle), Emmanuel Frimpong (knee), Francis Coquelin (hamstring), Andrey Arshavin (foot and ankle). The Gunners forward line can be potent when the attackers hit top gear but injuries have played a part in hampering the progresses of players like Theo Walcott (ankle, shoulder and groin), the Ox (ankle) and Lukas Podolski (foot and ankle). Despite the terribly unfortunate and inhumane amount of injuries that have ravaged Arsenal in times past, there is one player that stands out from the rest with more injuries than the amount of times Roman Abramovich hires and sacks managers. Abou Diaby arrived from AJ Auxerre in the 2006 winter transfer window and his lanky stature made the media vultures label him as the next Monsieur Vieira. He wore the No. 2 jersey last worn by the great Lee Dixon and he made 12 league appearances before suffering a horrific ankle fracture following a horrendous challenge from Sunderland’s Dan Smith. Between 2009 and 2012, Diaby suffered a hip injury, calf injury, knee ligament damage, ankle injury, another ankle surgery and a thigh strain. 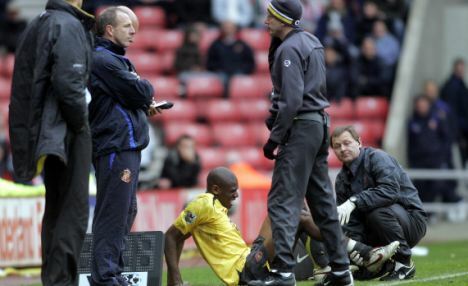 There was even a period in his career when he traveled to the Middle East and the United States in his bid to save his career but Diaby made a long-awaited comeback against Liverpool in Anfield last season only to leave the pitch after 26 minutes. “People say that I’m fragile and although I understand why, I am not fragile. I’ve had three operations on my ankle, all for different problems but the result of that was that my body is unbalanced, especially in my legs. I have overused one over the other and to put everything back in place is not easy. Diaby went on to say that his problem is “biomechanical” and blabbed about how good he is physically and mentally. With all the talent available at his disposal, Diaby cannot be banked upon to give his services on the pitch, as he tends to spend an eternity off it. After making one of his trademark returns, Diaby declared that he wants to repay the undying faith Arsene Wenger has shown to him and he intends to live up to his “massive potential” billing. This season, Diaby enjoyed a decent preseason by his standards and put up one of his finest outings in Arsenal colors in the 2-0 victory over Liverpool in Anfield. Comparisons between him and Vieira gathered momentum yet again and just when Arsenal taught that it was finally going to reap the fruits of it’s undying faith with Diaby, he suffered an injury against Chelsea in September that ended in a loss for the Gunners. Since his return to fitness, Diaby lacked that cutting edge he showed at the start of the season and he has been in and out of the team. His last performance against Swansea seemed good from a statistical point of view but he was culpable for being sloppy in possession and the introduction of Ramsey turned the game on its head. Just when we taught that things couldn’t get any worse for Diaby, the club confirmed that he has torn his anterior cruciate ligament on his left knee and he’ll be sidelined for eight to nine months. The never-ending injury tale of this talented midfielder has taken another twist and I cannot see Diaby coming back with a bang from this. At this point in time, my prayers are with the player but I believe that this is probably the last straw from an Arsenal perspective. The club has catered to his countless injuries and I’m sure that he has gone beyond the threshold. Diaby will certainly not be ranked among Arsenal’s much talked-about deadwood, but I feel it’s high time the club cashes in on the lanky Frenchman, when he returns to optimal fitness levels of course. Let’s face it, on his day Diaby can be a force to be reckoned with but what’s the use of having such an asset when it turns out to be a liability? Diaby has provided Arsenal fans with a lot of fond memories as well as pretty annoying ones, but it’s fair to say that his injuries are beyond normal. Probably a curse from beyond. Is he worth the large outlay? With the exception of Theo Walcott suffering an injury during the international break, everything seemed pretty good for Arsenal football club. Arsenal’s newbie, Nacho Monreal, played 90 minutes for his nation and provided the match-winning assist for Pedro Rodriguez as Spain grabbed an all-important win over France while Santi Cazorla had to make to with a place on the bench. From a French Arsenal perspective, Laurent Koscielny played for the entire game but that can’t be said about Olivier Giroud, that managed for get some game time in the dying moments. I don’t know if French boss, Didier Deschamps, was expecting the striker to perform some magic with just a handful of minutes to play. Elsewhere, Tomas Rosicky, Per Mertesacker and Thomas Vermaelen all played 90 minutes for their respective nations while Alex Oxlade-Chamberlain and Lukas Podolski had to be content with a place on the bench. With nine Premier League games to go, Arsenal will make a final surge for a fourth place finish as they continue breathe down the necks of Tottenham and Chelsea. The Gunners will have to make do with the current crop of players but as expected, the media has wasted no time in linking the Gunners with a host of players. Luca Toni is a household name in world football and he’s renowned for his amazing goals to game ratio in most of the clubs he’s played for. This journeyman no different from Nicolas Anelka has played for up to 14 different football clubs scattered across Italy and a big money move to Bayern Munich was sandwiched in between. Toni, like every footballer, is open to his own opinion but comparing Arsenal to Fiorentina in a ploy to make his teammate stay in Florence is pretty deluded if you ask me. I don’t watch Jovetic on a regular basis, but I humbly feel that he’s a bit overhyped like the Neymars of this world. On his day, he’s a pleasure to behold but he’s not what Arsenal needs at the moment. Arsene Wenger should be better suited searching for a recognized holding midfielder and an out-and-out striker to challenge Giroud for his place, not a young playmaker forward that would join a part of the squad flooded with personnel. “Arsenal are a big team who gave me the opportunity to play in Europe. I will always remember that, but I didn’t have the opportunities that I felt I deserved. No one can deny that Carlos Vela’s potential was massive and a hat-trick against Sheffield United in his full debut made fans drool. Vela couldn’t command a first-team berth but he showed glimpses of his quality when he was summoned on the pitch. His penchant for lobbing opposition goalies became a trademark and to be honest, he hardly disappointed when he was one on one, unlike the World’s Best Striker, Nicklas Bendtner. If I take you down memory lane, Arsenal fans and probably Arsene Wenger would curse the day the club let Zlatan Ibrahimovic of its sights as the mercurial Swede rejected Arsenal’s proposal for a trial before joining Ajax. After a successful spell in Holland, Zlatan has gone on to win a host of titles in leading European nations before settling for the petro-greens of Paris St. Germain. Lightening doesn’t strike twice but it seems as if Arsenal’s plans to hand Nigeria’s Sunshine Stars defender, Godfrey Oboabona, a trial is about to hit a massive brick wall. The defender was more than happy to fly to London to show what he was made of, despite the fact that the world witnessed his exploits in the concluded African Cup of Nations, where his team emerged victorious. On potential departures, Arsenal fans would be delighted to know that Mr. Calamity himself, Andre Santos, has expressed his desire to remain at Gremio on a permanent basis. Amen to that! Andre Santos was one of Arsene Wenger’s world-famous “panic buys” and he had the left back slot for keeps when Kieran Gibbs continued to struggle with niggling injuries. The Brazilian also spent a considerable chunk out as well when he injured his ankle in a dead rubber game against Olympiakos. At the start of the new season, Gibbs grew into his role admirably but Santos’ form waned so badly that Arsenal fans had nightmares by the mere sight of his name in the starting lineup. His stunt with Robin van Persie was the last straw and fans barraged him on Twitter for that act. His manager also lost confidence in his ability even to the extent when he delved into the transfer market on deadline day to sign a new left back when Gibbs got injured yet again. Like Odenilson, he has gone back home and has found solace in the front of his compatriots rather than a hostile environment across the Atlantic. Like Andre Santos, Arsenal’s out-of-favor Russian attacking midfielder is living on borrowed time and he’s heavily linked with a move to Azerbaijani outfit, Khazar Lankaran. The little magician set the Premier League ablaze in his debut campaign in the winter of 2009 and Arsenal fans regretted why he wasn’t eligible to play in the Champions League that season. As the years went by, he struggled with his form, fitness, work ethic, life in England and pretty much everything else to the dismay of the fans that sang his praises. Arshavin has gone so further down the pecking order that he now shares the same cave with Sebastien Squillaci. The Azerbaijani side is coached by Liverpool legend, John Toshack and the lure of a huge pay day in Azerbaijan would be something an aging player like Arshavin won’t think twice abut. Finally, Galatasaray are planning to have three Ivorian musketeers as they intend to sign Arsenal’s eccentric winger, Gervinho, to join Didier Drogba and cult hero, Farmer Emmanuel Eboue (I call him a farmer because he uses his body to till the football soil, I’m sure you get my drift). Gervinho has endured a bitter-sweet campaign as he enjoyed the early part of the season, even to the extent where he scored five goals in seven games but as the campaign progressed, we saw the old erratic Gervinho back and his gaping goal miss against Bradford City still goes down at one of my lowest points this season. A win over Bradford would have earned the Gunners a semifinal berth against an Aston Villa side they were odds on to win. Had the Gunners dispatched Aston Villa, Swansea would have stood in their way to glory and they would have hope to go one better in their second Capital One Cup final in three years. Alas! It was not to be as Gervinho alongside his teammates decided to be profligate despite scoring for fun in previous rounds. Well there’s actually no point crying over spilled milk. I’ll keep you updated with more transfer activity in the coming days, weeks and of course, months. The inetrlull is upon us yet again with several nations battling to secure a place in the 2014 World Cup in Brazil. The major highlight of tonight will surely be the crunch encounter bewteen France and Spain, and we can only hope to see a good game of football as two of Europe’s finest lock horns. A keen eye will be placed on Gunners representing their nations as Arsene Wenger would want his players to return to North London unscathed for the crucial tie against relegation-threatened Reading. Aaron Ramsey is be among the healthier pack as his red card against Scotland has ensured that he’ll play no part in their match against Eduardo da Silva’s Croatia. There were also concerns over the fitness of Gareth Bale but it seems as if the star player for Wales will be fit in time for the Croats. Elsewhere, Wojciech Szczesny might enjoy some more time in the dugout for Poland’s upcoming fixture and his chances of starting against Reading are probably slim to none. The Polish goalkeeper booked a place in the back pages when his old man went all ballistic on Arsene Wenger, stating that Arsenal’s gaffer was responsible for his dip in form. “My contract runs out in 2015. 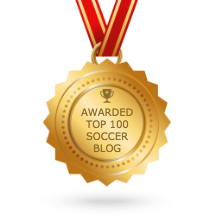 I have played my 100th game for Arsenal and I hope to play hundreds more. Physically, I can imagine myself at a different club, yes, but mentally, absolutely no. I’m too happy here. You have to admire Szczesny’s attitude and hope that he’ll do a lot better when he returns to the field of play. Bleacher Report’s James Dudko published an article giving five reasons why Szczesny is Arsenal’s most disappointing player and it’s fair to say that it caused a stir. At the young age of 22, Szczesny is bound to make some mistakes and he can only learn from them. When he was battling hard to cement a place in the first team in the 2010/11 campaign, he put up a lot of commanding performances that earned him plaudits despite Arsenal’s erratic defending that saw them concede a boatload of goals. Competition brings out the best in football players and we all know that Arsenal’s young goalie is going through a phase, which will surely pass. We all want the old Szczesny back and the sooner he rediscovers his form, the better for Arsene Wenger, his team and most importantly, the fans. After a dominant performance against minnows, San Marino, England visits Montenegro for another World Cup qualifier. Unlike San Marino, England shouldn’t expect the Montenegrins to roll over and play dead. 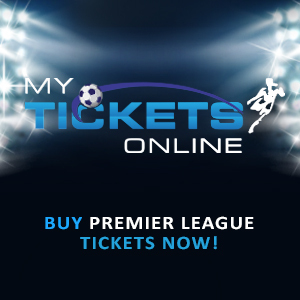 The hosts have a few household names and you can look no further than Blackburn’s Simon Vukcevic, Juventus’ Mirko Vucinic and Fiorentina’s Stevan Jovetic. Arsenal’s Alex Oxlade-Chamberlain will be odds on to build on his performance against San Marino marauding the wings for his nation. However, the Ox has expressed his disappointment with his lack of first-team appearances this season. The speedster had his breakthrough last season at the young age of 18 and the media waxed lyrical about his performances. To tope it all off, the youngster was called up by Wily Ol’ Woy Hodgson to the European Championships but he featured sparingly for his nation. With Theo Walcott out injured, the Ox was drafted into his place and performed admirably against San Marino. Many are also tipping the Ox to take Walcott’s place in the team against Reading but he’ll have to work hard to cement a place in the team, even if it seems like a tough ask. This season, Ox has tried to “over impress” by showing off his dribbling skills but there have been periods when he went a la Diaby to dwell on the ball far too long when a simple pass to a teammate close by would have been a better alternative. He still has age on his side and he’s highly favored by Wenger so he has to rest assured that under the manager’s tutelage, he could be a world beater. A good performance against Montenegro coupled with another confidence-boosting performance against Reading will go a long way in bringing the Ox to the fan’s good books. It’s not as if Walcott has been superb recently as well. If Arsene Wenger had the big balls to bench Szczesny and his captain, Thomas Vermaelen, I don’t think Walcott would be any different. #Justsaying. To wrap things up, the Young Guns of the NextGen Series are through to the semis after a win over CSKA Moscow at the Emirates and Nigeria’s Sunshine Stars defender, Godfrey Oboabona, has been handed a trial at Arsenal. The lad was one of Nigeria’s standout performers in the last AFCON and I wish him the best of luck. Let’s hope for a clean bill of health for every Gunner tonight.